Can you Imagine, your spare change can make extra money for you? Acorns invest your spare change in the high-quality index stocks and make your investment portfolio to meet your financial goal. This is one of the best way to invest and make money without affecting your pocket. Everyone must have had a piggy bank to save money, but here, you are investing rather than saving. The signup process is very short and simple, as Acorns made it user-friendly. It can be done on mobile Acorns app or a web browser. You will be asked to fill up your email address and setup 4 digit password. Once this is done, you will need to link your bank checking account for round-ups spare money investment. Any debit or credit card linked to your registered bank account can be used to take benefits from Round-up investment. Acorns encrypt and protect your information with high-level security. How Acorns Spare Change Investment Works? Do you visit a shop and buy a thing you want? Yes, right! Suppose, you bought something for $3.75 at any shop or online, Acorns will automatically round-up the amount to $4.00 and invest the difference $0.25 to your investment account. You must be having expenses like coffee, traveling, clothes, etc. Normally people do visit 3 times a day for buying things. In this case, you are investing $0.75 a day which equals to $22.5 a month. This money is going to your investment account. So, every time you purchase, a small amount will get invested to your investment portfolio. Simple! Here, you do not need to do anything by yourself. Acorns will do it for you. 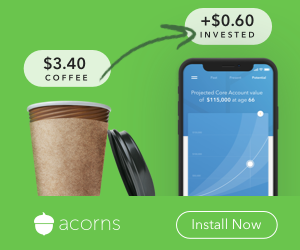 📢 Get $5 Sign Up Bonus From Acorns. Start With Small Amount of $5. Acorns will create your investment portfolio or give you an option to create portfolio on your own. They invest your round-ups money to the high quality/dividend paying stocks. You can check your investment every day on Acorns App. Swell investment company which is as similar as Acorns. Swell will help you to invest in high growth companies that solve global issues. Check here. If you are good at saving or not good at it. Acorns benefit both types of people. Saving money is better than investing money, especially when you have an option like Acorns that you may never find this type of investing options everywhere. Acorns will invest in high-quality stocks on behalf of you by financial experts. It is best for the one who wants to create their own passive income source. You can start taking the benefits from Acorns spare money investment scheme when you link your debit or credit card to Acorns. There are 4,000,000 people who joined Acorns to become financially stronger. Where Acorns Invest Your Money? Acorns follow Modern Portfolio Theory for better income results. They diversify your investment into different asset classes within the Exchange traded funds like stocks(large to small size companies), Real Estate, corporate & Government bonds and emerging market. Diversified style of investment is followed by many great investors and they made a huge fortune in the stock market. Acorns will do all these for you. The father of Modern Portfolio Theory, Harry Markowitz is involved in creating the investment portfolio for Acorns members. When you join Acorns, you will be asked to select a portfolio out of five different sub-portfolios such as conservative, moderately conservative, moderate, moderately aggressive and aggressive. See the portfolio segregation below. Each portfolio has its own weightage in stocks and bond. High weight on stock investment has a high income, but high risk. High weightage on Bond investment has high safety, but low income on the investment. Both has its own benefits. You need to select which one is best for you, or else leave it to Acorns. They will analyze your current status/profile and get you the right portfolio for your investment. How to Create your portfolio for Round-up investment? Acorns will ask you some basic question to understand your financial goal for the future. The questions can be related to your saving goals, age, income, time of retirement, etc. Based on the information, Acorns will recommend you the best portfolio that you should take to meet your goal. You can also choose the portfolio by your own. It’s up to you. But, I would advise you to select what Acorns recommend you. Later you can change your portfolio if you didn’t like. Acorns will also show you the diversification of your investment as per portfolio selected. See more stock investing apps. Once everything is done, you can check the performance of your portfolio during the stock market working time. Moreover, you will be able to see how much round-offs were contributed to your portfolio and how they are performing. There are other additional features that make Acorns all in one app. It will help you with money in different ways and you should be using it all the time. Sign Up for Acorns and Start Earning Money from Today Plus Get $5 Bonus. Acorns have a partnership with many big brands who provide cash back directly to your linked bank with Acorns. To get cash back on a purchase on any items, simply open the app and select the retailer. Retailers who partnered with Acorns and providing cash backs are Walmart, Airbnb, Apple, Nike, The Wall Street Journal and many more(big brands). You will receive 1-2% of cash back from the retailers. You can give Acorns gift card to your friends or relative and make them aware of Acorns investing ideas. Acorns is a very good platform to start investment journey in a unique and systematic way. Acorns app should be there with the people who do not have time to spend more time to create their investment plans. A gift card by you can give them a chance to understand Acorns. If you like the round-up Acorns investment idea and want to invest more in it, then you can use the multiplier option to boost your contribution. In this option, you can multiply the round-up contribution by 2X to 10X. For example; if your round-up contribution goes to $0.25 and you want to invest double than actual round-up, then you can select 2X multiplier option and get $0.50 invested to your investment portfolio. 10X is the maximum limit to multiply your round-up contribution. You can also choose direct deposit, if you want to invest more. Now it’s up to you, how much you are ready to invest through Acorns and create your passive income from Acorns investment. The more you invest, the faster your wealth will generate. This idea is good to reach your financial freedom and stability. Acorns have a debit card facility where you can keep your money and use it for purchase. The advantage to use Acorns debit card is, when you purchase anything, the money will be round-up on the spot. There will be no delay in round-ups like other bank’s cards. The Acorns checking account provides facilities such as zero overdraft charges, unlimited ATM usage and zero balance account. If you want to invest something for your retirement to see good money with good returns in the future, then Acorns has an option called Acorns later. You can now create your own Individual Retire Account(IRA) or roll over your existing IRA or 401k to Acorns. They have their dedicated team to help you out. It’s a great investment plan especially for the young people who can invest little portion from their savings. You can set an auto deduction for a specific amount from your account to invest regularly through Acorns. Acorns will automatically deduct a certain amount which will be agreed by you and invest the deducted amount to your selected investment portfolio. This is for the one who wants to invest little extra for extra income. You may be wanting to withdraw your earned money on Acorns or you may require some funds to pay your bills or expenses. In Acorns, it’s easy to withdraw your funds/profit and get it transferred to the checking bank account which is linked to Acorns. The withdrawal process takes 5-7 working days. You can request for withdrawal at any time, there are no charges on withdrawing funds. Acorns is completely free to join. To get started, you will be asked to make an initial investment for your portfolio. The Initial investment is $5 which will go directly to your investment portfolio. It also activates your account for other free benefits like trading, transfer, etc. They have some low-cost premium plans which is $1/month plan. This plan is free for college students. There are other low price plans that cost $2/month and $3/month, but it comes with a great feature which is value for money. Let me explain to you about plans in detail. Round-ups investment, Create your smart portfolio, Found money facility. Acorns Core features + Individual Retirement Account(IRA), Recurring Contribution, automatic updates and IRA & 401k rollovers. Includes all Acorns core and Acorns later features + Real-time Round-ups, custom spends strategies, automatic retirement savings, Direct deposits, mobile check deposits, Fee reimbursement ATMs, No charges on overdraft & no minimum balance on acorns debit card account. I believe this is one of the cheapest plans for investment and other money-related benefits. There are companies in the investment industry who charge in percentage which eventually become unaffordable fee. So, it’s a great price opportunity that Acorns is giving to the new investors. Acorns is completely a legit company. It is best for students, new investors and the one who has a small amount of money to invest. As Acorns is managed by highly qualified financial experts, your spare money is in the good hand who can create a regular income on your investments. You can buy a $1/month plan which is lot lesser than a cup of coffee at the restaurant. Acorns automatically round-ups to your spare change and get it invested to Index fund. You do not need to do anything. If you have bigger plans for investment, then you can go for a $2/month plan which is again a very cheap, but best services. A $1/month plan is free for college students. They can take full advantage and plan their investment for financial freedom at an early age. Acorns is the platform who takes a small amount of money each time you go to the shop and you don’t even notice that your round-ups money has been taken by Acorns and invested in your portfolio. The small amount of money one day can become huge money in your investment portfolio. 21 Best Side Income Ideas You Can Start Right Now. Thanks, Smith. Always provide valuable content to the visitors and be genuine.